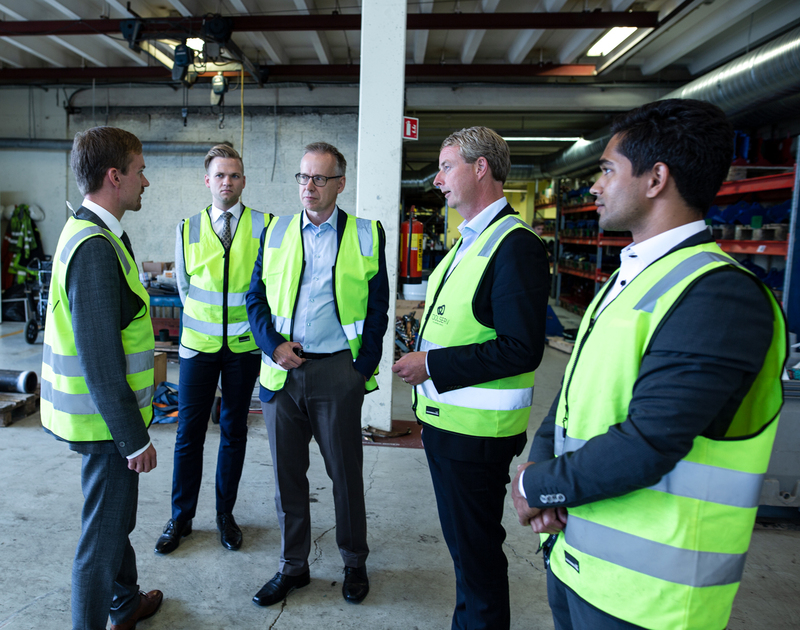 Toolserv’s cutting-edge research and development in downhole tools and unique business processes were shared with Norway’s Energy Minister, Terje Søviknes, during a site visit to illustrate how the company compete with the major service companies. The Minister was welcomed to the company headquarters in Stavanger on 23rd August 2018 by General Manager, Mike Williamson and Account Manager, Christian Lyse. Mike and Christian, alongside Design Engineer, Geir Lunde, explained how Toolserv give design engineers the power and autonomy to make project decisions, by creating a fast paced, un-bureaucratic development process. This agility enables the company to step-in and offer a solution when the big players are either too slow or unwilling to invest time or resources to solve the operator issue. This insight led the group into an interesting discussion on the role of global service companies, Toolserv’s experiences of working with Equinor and other operators, and the future of the NCS. How companies like Toolserv can retain staff during an upturn was a positive discussion as the company were able to demonstrate their commitment to invest in the training and development of their people. The Minister was impressed to hear that Account Manager, Christian Lyse, recently completed his MBA, while continuing to work full time, since the company approves time off for class attendance. Mike and Christian then took the Minister on a tour of the company facilities to show him the workshops and talk about how government funding from Demo2000 (Forskningsrådet), IFU (Innovasjon Norge) and skattefunn over the last four years have helped Toolserv’s development. The team at Toolserv would like to thank Minister Terje Søviknes for his time and interest. It was a very insightful and positive visit for all.